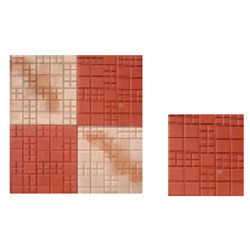 The consistent and sincere efforts of our firm to become the best in global market have helped us in manufacturing and successfully supplying a huge and assorted array of Decorative Floor Tiles at economical prices. For manufacturing and processing these offered tiles, our expert personnel use only top grade ceramic and highly developed technology in adherence with market set norms. Additionally, our quality supervisors keenly check these tiles on several measured, so as to offer a defect free assortment of tiles at our patrons’ premises. Area per tiles 1.73 square ft. Incorporated in the year 1947, Mangalore Tiles Ltd. is well known in the market with its brand name "Omtiles". We are indulged in manufacturing and supplying a qualitative range of Tiles.. Because of our client centric approach and quality compliance, our offered products are manufactured making use of premium quality raw material. We are offering our customers an extensive range of products which includes Shot Blasted Pavers, Brick Shot Blasted Pavers, Shot Blasted Pavers, Shot Blasted Zig Zag Pavers, Designer Paving Bricks, Normal Interlocks, Cement Interlocking Wall Building Blocks, Concrete Wall Tiles, Concrete Designer Floor Tiles etc. to our precious clients. In compliance with the standards laid down by the domestic industry and international quality norms, we are examining these products under the strict supervision of our professionals. In addition to this, we are producing the raw material used in the production process from certified suppliers of the industry to maintain the quality of our offered product range.